The Israeli winter does not allow us to wear many layers and thick coats, and I am always in search for a solution that will create a wintery warm look, that is still light and not bulky. A jacket is the ideal solution in my opinion; it’s light on the one hand, but embracing and warm on the other. I designed a blazer-style jacket. The collar is wide and classic, the shape is close-fitting and flattering, and two front pockets give it a light chic look. I used a thick cotton fabric with a small dot texture; the same fabric I used for the ‘Pocket’ skirt. It’s a soft cozy fabric that creates a warm wintery look. The inner lining is golden cream-shaded Satin, nicely contrasting the dark brown color of the jacket. I gave great importance to the buttons. I looked for the perfect solution for my blazer in many haberdasheries. 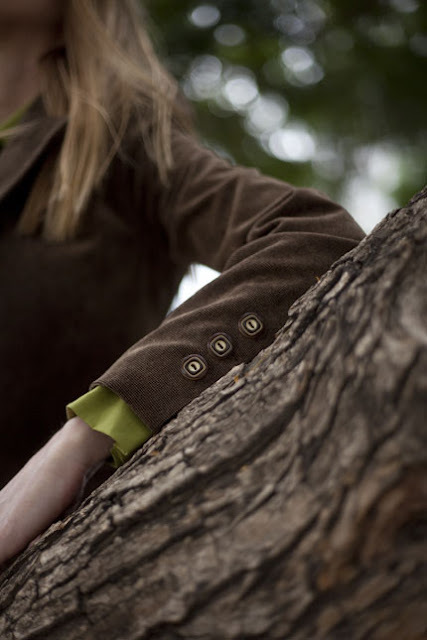 Buttons give the final and decisive touch in every jacket. I found retro style buttons, combining two shades, brown and cream. I loved their graphic shape and their size on the jacket. I placed three buttons on the front of the jacket and three more on each sleeve. I love matching this blazer with a buttoned blouse or a light sweater. I took the pictures with this model on Rothschild Ave. with the ‘Sherlock’ skirt I wrote about in a previous post. In my next post I will present at length the green blouse with a new fold skirt. I would love to see you all on Thursdays and Fridays at Dizingoff Center, in the designers’ avenue, where I present my winter collection along with items left from the summer collection. I have purchased this outfit and been getting amazing comments. I've been trying to look blazer like this, I just like it, brown blazers are really great for styling when it comes to men and women.